Today, I witnessed just how fast technology development is moving as competition heats up in the digital media space. Within a matter of hours, I not only Tweeted about a recent article from GigaOm saying that tablets are already replacing traditional devices (i.e. 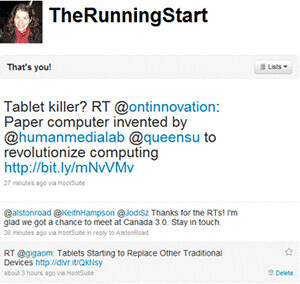 laptops and netbooks) but then discovered a news release Tweeted by Interactive Ontario (IO) about a new technology that has just been invented by Queen’s University and Human Media Lab. The new “PaperPhone” technology is being touted as the next potential smartphone and tablet killer. According to the IO news release, tablets and smartphones, the killers of the devices that we use today are already projected to be obsolete in the next 5 to 10 years. This week, I attended the Canada 3.0 conference in Stratford, Ontario. One of the biggest issues discussed at the conference was that Canada needs to step up its game in the digital media technology space or get left behind. It was great to hear that a new potential “tablet killer” has been invented in Ontario. However, speakers at the conference were adamant that the Canadian government invest more into an ecosystem to support Canadian entrepreneurs and help them to get the funding and support they need to meet the lightning speed demands of the market. Buckle your seat belts Canada, it’s gonna be a wild ride!